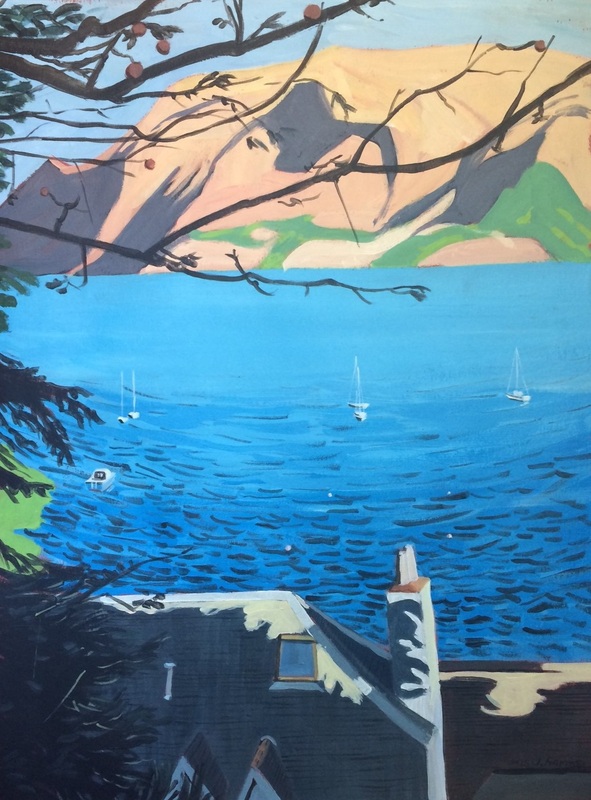 Portree, another view 2015 | J.Harms. Portree, another view. 2015. J.Harms. 29x39cm. Acrylic on paper. Portree is Skye’s main town. It’s a very pretty place. The usual view people remember from Portree are the colorful houses lining the bay. I admit I really liked those little houses but I came across the view I painted while wandering down the city. It was a gloriously sunny day, and over the roofs, I spotted this particular riviera-esque view. I couldn’t quite get over the color of the sea. I love the lines of the mountain across the water – it looks alive. And I also like your description of finding a different view that caught your attention and was out of the way. We see a new perspective on things from your work! Thank you. This is lovely – I especially like the shadow areas. I always struggle to know what colour shadows are, but you’ve really nailed them in this picture. Thanks a lot Rebecca. Some paintings just work out more than others somehow; I think I had a good day the day I painted this particular one. Definitely! (I know that feeling). Beautiful! Love your contrast with the light and the shadows! Great work! Thank you ! I thought the view was beautiful so I’m glad I could render it. You’ve got an unusual style, with a good eye for depth & shadows, and the saturated color makes it all the better. Kudos.